Big storage capacities, short charging times, and no burnable liquid electrolytes – the solid-state battery is to enable safe electric mobility with large ranges in the future. Now 14 scientific institutions including the Karlsruhe Institute of Technology (KIT) have formed the "FestBatt" competence cluster to work together on this next battery generation. The Federal Ministry of Education and Research (BMBF) funds research and development with EUR 16 million. The competence cluster is coordinated by the University of Gießen (JLU). Climate change, pollutant emission by road traffic, and the finite nature of fossil fuels make sustainable energy technology an important task for the future. In particular, storage systems for regenerative energies are required. Scientists are presently working on a mix of very different batteries tailored to use in electric vehicles or storage systems for industrial applications and private households. Apart from the already established lithium-ion batteries with liquid electrolytes inside the battery, work increasingly focuses on batteries with electrolytes based on solid materials. "Such solid-state batteries are fireproof and might enable larger storage capacities and quicker charging processes in the future," says Professor Helmut Ehrenberg of KIT's Institute for Applied Materials (IAM). This type of battery could ensure safe electric mobility with large ranges and might also prove to be very suitable for stationary applications like storage systems for power from private photovoltaics facilities. But to reach these goals, there is still considerable need for research, Ehrenberg emphasizes. This is the starting point for the new competence cluster for solid-state batteries "FestBatt" coordinated by Professor Jürgen Janek (JLU). It unites the efforts of all German institutions conducting research into solid electrolytes and solid-state batteries, including universities and research centers of the Helmholtz Association and the Fraunhofer Society. Several KIT institutes are involved in the cluster and have been granted funds with a total amount of EUR 3.95 million for the first project phase of three years. Within "FestBatt," fundamental knowledge on solid-state batteries will be developed, the scientists want to understand and describe their functioning in detail and plan to develop operable prototypes. The competence cluster also is to lay the foundation for the establishment and sustainable further development of an internationally leading and competitive battery cell production sector in Germany. "FestBatt" consists of five joint projects: three materials and two methods platforms. The first project phase will focus on the reproducible production of appropriate solid electrolytes. "Selection of compatible materials is essential for later cell design. The electrochemical characterization made here yields most important material-specific parameters and enables selection of efficient combinations of materials," says Professor Ellen Ivers-Tiffée, who is involved in the KIT-coordinated methods platform for characterization together with Ehrenberg. Their cooperation partners come from Jülich, Gießen, and Marburg. KIT is also active in all other platforms of the competence cluster. Professor Britta Nestler (IAM), Dr. Michael Selzer (IAM), and Professor Arnulf Latz from the German Aerospace Center (DLR) and the Helmholtz Institute Ulm (HIU, a Helmholtz Institute established by KIT in cooperation with Ulm University) participate in another methods platform that covers theories and data relating to the solid-state battery. Professor Michael Hoffmann (IAM) is active in a materials platform to study various oxides. Within the framework of another materials platform, Professor Patrick Théato of KIT's Institute for Chemical Technology and Polymer Chemistry (ITCP) and Professor Stefano Passerini and Dr. Dominic Bresser (HIU) develop new polymer-based solid electrolyte systems and study them with respect to their suitability for solid-state batteries, including subsequent upscaling of the most promising systems and production of lithium-polymer batteries. The new competence cluster complements the large range of activities of KIT in the area of electrochemical energy storage research. From the development of novel electrode materials for lithium and post-lithium technologies to the efficient production of large-format cells on the industrial scale, to their interconnection and battery management, all relevant aspects of battery development are covered by the "KIT Battery Technical Center." 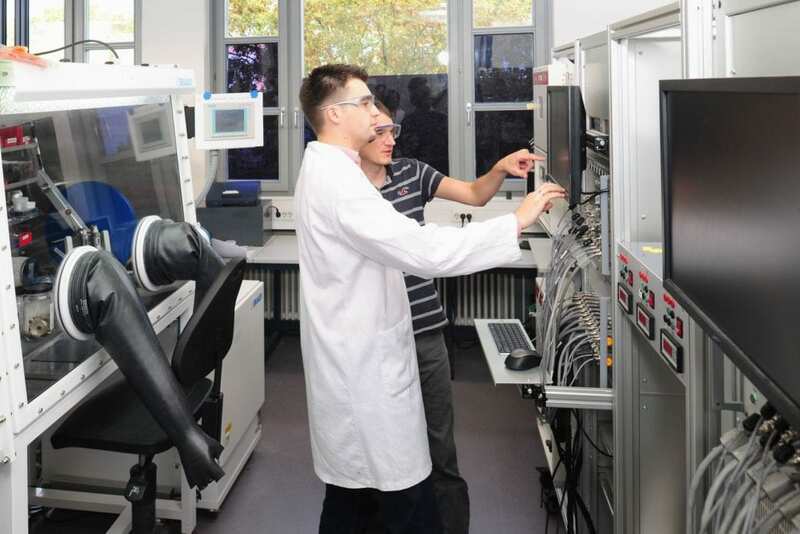 Work of the "Center for Electrochemical Energy Storage Ulm and Karlsruhe" (CELEST) established this year, of which KIT is a major partner, focuses on the development of lithium and post-lithium technologies as well as on fireproof and resource-compatible alternatives, such as the redox-flow cell, on fuel cells as energy converters, and on education of young researchers.